Israel, judged by its actions, isn’t interested in peace. 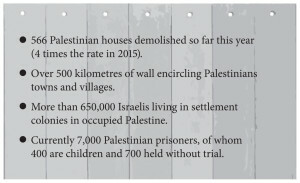 By erecting more and more settlements on Palestinian land, it is in the process of building Palestine out of existence. It is not only our right to boycott those who aid and abet this occupation and, now, colonisation of Palestine – it is our duty. 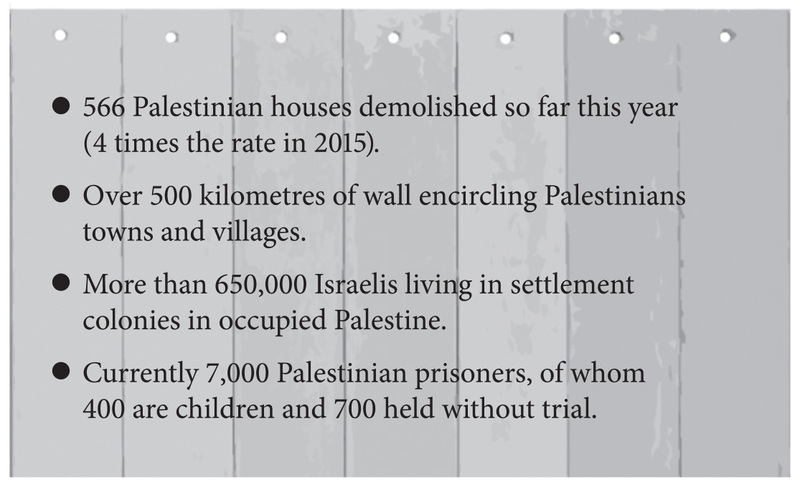 Next year it will be 50 years since the occupation of Jerusalem, the West Bank and Gaza. 10 years since the siege of Gaza began, with 75,000 still displaced from their homes since the Israeli bombardment of Gaza in 2014. This year, to 18th April, 63 people have been killed, 59 of these people are Palestinians killed by Israeli forces. Over 1,600 Palestinians have been injured[i]. The UN Guiding Principles for Business and Human Rights make it the duty of states to uphold human rights. The British Government says principles of human rights should apply the world over and calls on businesses, trade unions and civil society to help them. Yet, they have continually failed to act over Israel’s violation of Palestinian human rights. Instead, in recent months the British Government and its Ministers have unleashed a series of attacks on supporters of Palestine who advocate Boycott, Divestment and Sanctions of Israeli institutions and companies complicit with breaches of Palestinian human rights. These attacks have been accompanied by systematic efforts to suppress legitimate criticism of Israel by branding it extremist, divisive, and antisemitic. Human rights are indivisible and global. It is not racist to criticise a state because of its laws and actions, it is not racist to campaign for those laws and actions to be changed. It is antisemitic to promote hatred or discrimination of Jewish people because of their religion or ethnicity. As an anti-racist organisation, we abhor racism directed at any group – we challenge it wherever it is found. The government’s attempt to promote fear and intimidation of legitimate protest and to smear human rights defenders will only assist the real racists. We support the Palestinian-led call for a Boycott, Divestment and Sanctions campaign which uses effective-yet-peaceful means to pressure Israel to end the occupation and ensure Palestinians have the rights we take for granted. It is civil society holding countries and companies accountable for their actions. Boycott is the tool human rights defenders have used throughout history. It is a non-violent, global and traditional form of protest used to oppose oppression. It is not racist to refuse to buy, decline to invest in or stop supplying goods, arms or services to companies and institutions that are knowingly supporting breaches of human rights and international law. Rather than attack those defending human rights, the British Government should be challenging Israel for its actions that breach international law. Trying to suppress the right to protest will not undermine the campaign for Palestinian human rights – it will strengthen it. We proudly continue in the tradition of civil and human rights activists before us. If it was good enough for Gandhi, Luther King Jr, and Mandela; boycott is good enough for us. PSC is part of a growing global movement in support of Palestine, proudly refusing to do business with Israel’s occupation, colonisation, and discrimination.